Madison Long is on a roll — and don’t expect it to slow any time soon. In her final semester at Purdue, the accounting major from Indianapolis made Poets & Quants 2017 Best and Brightest Business Undergrads list, earned recognition as an Outstanding Senior in the School of Management, and received Krannert’s Dr. Cornell A. Bell and Emanuel Thornton Weiler Outstanding Student awards. 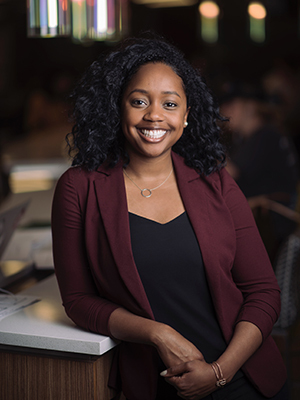 During her time on campus, Long also served as co-chair of the Doster Leadership Conference, vice president of the School of Management Council, and executive director of diversity and inclusion for Purdue Student Government. She was also a member of the Society of Minority Managers and was part of Krannert’s second-place team at the 2015 National Black MBA Undergraduate Case Competition. Between semesters, she completed internships at Amway Global, Deloitte Consulting and most recently Microsoft, which offered her a full-time position as a Finance Rotational Program Analyst before she began her senior year. Long, who arrived at Krannert as a Purdue University Emerging Leader Scholar and Dr. Cornell A. Bell Business Opportunity Program Scholar, credits her involvement with student organizations as a key to her success. “Just by just putting myself out there, I was able to develop confidence, networking skills and professional development, as well as a great cohort of peers who supported me and allowed me to see all the possibilities,” she says. Long says she wouldn’t have attended Purdue if not for Krannert’s Business Opportunity Program (BOP). “I was debating between a smaller school and a bigger school,” she says. It was BOP’s individualized attention, mentor program and student community that led her to becoming a Boilermaker. “Choosing a college was the biggest decision I’ve ever faced, but coming to Purdue and being part of BOP was the best one I could have made,” Long says. And she was a proud alumna when the program celebrated its 50th anniversary in 2018.